Every December retirees from the New England and Midwestern states begin their annual winter trip to Florida, where they will stay until the spring. Florida auto transporters call them “snowbirds”, people who are escaping the colder states for the more hospitable, tropical breeze blowing in from the Caribbean and the Gulf of Mexico. 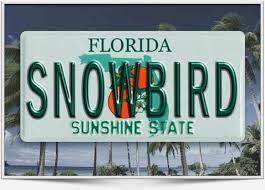 The snowbirds want their own car in Florida for the 3 to 6 months they typically stay. Some people drive their car to Florida, but many prefer to hire an auto transport company to arrange shipping their car. Is it cheaper to ship a car or drive it? The answer is that it usually is less expensive to drive it … unless one thing goes wrong. That could be a blown tire, transmission, fuel pump or so many other things. Even if nothing goes wrong, the extra miles on the car is a consideration. A round trip from Chicago to Miami is nearly 3,000 miles. There is also wear and tear on the driver and passenger, and that takes a different toll on every person. For tens of thousands of people, the decision to ship a car to Florida rather than drive it is the best option. 1. When Should A Snowbird Make The Car Available To Ship? Answer: Let’s say you personally arrive in Florida on the 10th of the month, and a car shipper can deliver your vehicle (once picked up) in three days. Let us also suppose that there is nobody else in Florida who can receive your vehicle and pay the driver. Therefore, you should not make your vehicle available before the 7th of the month, because you do not want your car to beat you there. 2. When Should A Snowbird Actually Book Their Auto Transport? Answer: Do not book your vehicle shipment until about a few days before your vehicle is available to ship. Three days ahead is about right. Please know that it does not matter to the carriers when you book your shipment. There are no space reservations, so booking early does nothing for you and might actually hurt your chances of a timely shipment. You are competing with thousands of other snowbirds for limited space, so you want the most current car shipping rates and not something old and stale. The auto shipping rates typically creep up through December and reach their zenith the first week of January. The highest priced loads (cars) typically move first. For the most current auto shipping rates, please use our first of a kind car shipping quote calculator located on this page. 3. What If The Snowbird Leaves Home Before The Car? What Then? Answer: It is almost impossible to not be inconvenienced at either end of a vehicle shipment when somebody is shipping a car to himself. Usually at the origination, there are family, friends and neighbors who would be kind enough to spend 30 minutes to meet a driver for you. No money changes hands at that meeting, just vehicle inspection, signing the Bill of Lading authorizing the shipment, and handing over a set of keys. That secondary contact of yours relieves so much stress on both you and the auto shipper. 4. How Does A Snowbird Know What Auto Transport Rate To Pay? Answer: Depending on how much of a hurry the snowbird is in determines the auto shipping cost he should pay. There are many car transport companies who will low ball the auto shipping rate, knowing full well that all the higher priced loads will move first. If you don’t mind waiting weeks or maybe even a month to receive your car in Florida, then okay, book a cheap vehicle shipping rate, but know that you are probably in the back of the line. Most people want their vehicle in Florida as quick as possible. After all, if the snowbird is only in Florida for 3 months, does he want to waste a month without his car? The more responsible auto transport companies will adhere to the true market rate for shipping a vehicle inside of 7 days from availability. The customer may see a huge disparity in car shipping estimates from numerous brokers. Choose one of the higher rates when shipping to Florida in the winter. It doesn’t have to be the highest, but most certainly don’t bite on the low-ball rates that some are hustling. Direct Express Auto Transport could book a lot more orders with low-ball rates to Florida, but we prefer to have happy customers whose vehicles ship first and in a timely fashion. Please use our auto transport quotes calculator on this page to see our rates. 5. Should A Snowbird Use The Multiple Quote Forms Found Online? Answer: It is never a bad idea performing due diligence. However, usually the weaker car shipping companies participate in the multiple quote leads programs. They know they are competing with 9 other brokers, so there is downward pressure on their car shipping rates that is actually a disservice to the customer. They book orders that they know cannot ship in a timely fashion. It’s called bait and switch and they are notorious for it. If you do fill out one of those forms, do not provide your telephone number, as those brokers will call you incessantly. It’s one thing to have your email inbox fill up (move to spam when tired of it) and quite another to have your cell phone bombarded. Fortunately if you are reading this blog, then you have already found your way to a reliable auto shipping company. So feel confident with Direct Express Auto Transport and use our car shipping rates calculator located on this page. You can even book it online or call us at 800-600-3750.